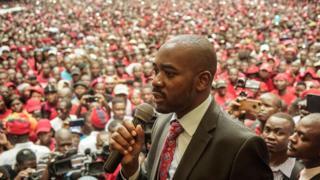 In his tailored suits and designer jewellery, Zimbabwe's main opposition leader Nelson Chamisa can work a crowd with all the drama of the Pentecostal preacher that he is. At 40, he is nearly half the age of President Emmerson Mnangagwa, who took over as leader of the country after Robert Mugabe was forced from office in November and won an election in July - which Mr Chamisa is challenging. He only became leader of the Movement for Democratic Change (MDC) in February, following the death of Morgan Tsvangirai - the former union leader who founded the party in 1999. Years earlier, Mr Tsvangirai had been drawn to the student leader's charisma and eloquence, taking him under his wing. But in his short time at the helm, Mr Chamisa's grandstanding has got him into trouble. At a rally earlier this year he said that he had met US President Donald Trump , who had "promised" to pump $15bn (£11.3bn) into the cash-strapped country should the MDC win the July elections. The US government said the statement was false and the MDC was reportedly forced to apologise. He was then rebuffed by Paul Kagame who tweeted that he hadn't a clue who the MDC leader was after another campaign trail claim. Mr Chamisa had boasted that when he was technology minister in the Mugabe-led coalition government, set up following the disputed 2008 poll, he had met the Rwandan leader and been instrumental in crafting a digital strategy that has been key to Rwanda's economic success. Mr Chamisa hit back by posting a photo of him shaking the president's hand. He has also been called sexist after telling voters he would marry off his 18-year-old sister to Mr Mnangagwa if his rival only won 5% the vote in July. He later said it was a joke: "It was just a political banter that I used to illustrate that even if I promised to give him my most prized possession, he would still not be able to defeat us in a free and fair election." The apology generated more controversy, which he batted away in a BBC interview. "What's disrespectful? As far as I am concerned, it is part of our culture. When your sister is about to get married, as a brother you must help her." Witty and humorous orator - his rallies and news conferences are accompanied by much laughter. In spite of these gaffes he remains hugely popular, especially among the young and unemployed - more than half of Zimbabweans are under the age of 25. After years of Mr Mugabe's rule, many of them had wanted a young and energetic person to lead. A youth movement calling itself #GenerationalConsensus campaigned on his behalf in the election, saying the aspirations of the young people have been "suffocated by the past generation". And in the end he won 44.3% of nearly five million votes cast. His critics say the way he took over the leadership of the MDC in February was "unAfrican" as he was jostling for power before Mr Tsvangirai was buried. He elbowed aside two other party vice-presidents to be appointed leader by the national executive committee. One of them, Thokozani Khupe, accused him of "shamelessly staging a coup" and she broke away from the party. Most party officials back Mr Chamisa - as do supporters, given the comparative turnout at rallies - but the split may have cost him votes among those who disapprove of the way he took power. Having two MDCs on the parliamentary ballot paper also confused some voters. In some constituencies the races were so close that they could have gone to the opposition had it not been split. Mr Chamisa stood as the candidate for the MDC Alliance, a group composed of the party's other splinter groups and smaller parties. He failed to unite the opposition - more than 50 parties contested the parliamentary vote and there were 23 candidates on the presidential ballot. Although Mr Mugabe's former spin doctor Jonathan Moyo, now in exile, came out in support of the MDC leader. A prolific tweeter, he launched the hashtag #KwekweHimJuly30. Born in the south-eastern town of Masvingo two years before the country gained independence, Mr Chamisa only became eligible to run for president in February when he turned 40. Improve trade and investment policy to cut immigration and administrative red tape. A practising lawyer, he also qualified as a pastor two years ago after studying theology at a local seminary. He often preaches in church and posts about praying and the Bible. But his main passion has always been politics, being elected secretary general of the powerful Zimbabwe National Students Union (Zinasu) in 1999. He became a founding member of the MDC that year, serving as its youth leader and becoming in 2003 a member of parliament at the age of 25. He is one of the few remaining party executive members from this era. Is it easier to poke fun after Mugabe? What happened to Mugabe's land reforms? Like many other MDC members, the married father of one has suffered for his opposition to Mr Mugabe. In 2007, during a crackdown on the opposition, he was on his way to a conference in Europe when he was beaten up by state security agents at the airport, fracturing his skull. After his four years in the coalition government, many blamed him for the MDC's defeat in the 2013 election. He was accused of imposing unknown candidates, and lost his executive position within the party. But there is no doubting the man's energy - he fought back and Mr Tsvangirai appointed him as one of his deputies in 2016, a role that should have been voted on by party delegates. The MDC leader's newly appointed spokesperson, Nkululeko Sibanda, says in the close to 20 years he has known Mr Chamisa, no-one has worked harder. "He is a man with a sense of purpose who does not give up on his values," he said. With such drive, Mr Chamisa had hoped to make history in July to become Zimbabwe's youngest president and change the country's name to "Great Zimbabwe", a reference to a thriving empire in the Middle Ages some of whose impressive stone walls still stand outside the city of Masvingo. "I see a Great Zimbabwe beyond this Zimbabwe ruins," is his oft-repeated refrain. And if he can use end divisions and the bickering within the opposition over the next couple of years, he may still have a chance of winning the presidency in the future.